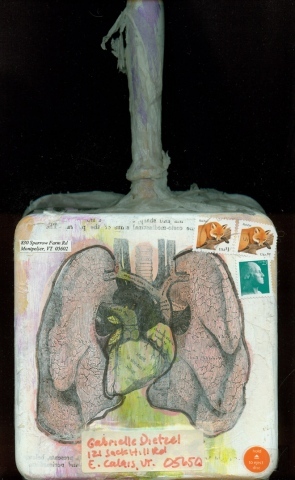 This extra-fancy frying pan has been painted, decorated with a reverse collage of lungs (sent to a man with health issues), and swathed in varnished tissue paper. It cost $2.23 to send it ten miles with its message written on the fry surface. "Dear Gabrielle and Roy- Why not make a nice fried egg, maybe with fried toast-- we used to call that 'toad in a hole'-- and then you can sit out on your beautiful porch in a snowbank and watch the clouds go by--"